The Military Time Clock shown above defaults to military time based on your current local time showing you what time it is in military time right now where you are. Keep in mind that the current military time clock on this page features a colon (“:”) between the minutes and the seconds. Seconds are not traditionally notated but was added for conversion purposes and so you could track real-time including seconds. The top time clock notates military time and the bottom clock notates standard time (the traditional AM/PM 12 hour time keeping system). 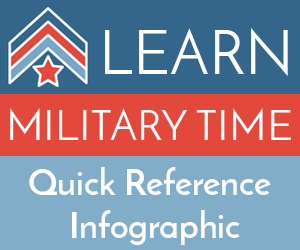 This tool was created to make it very simple to tell military time while comparing it to standard time. The “military time right now” tool below pulls your local time from your smartphone, tablet, or desktop and converts it into military time (24 hour time keeping) system. You can change the time on your device and refresh the page and the military time will update automagically! Short of learning to convert current military time right now, this is the fastest tool available to check when needed. Be sure to save this page to your favorites! You can refer to the sidebar (to the right on a tablet or pc, to the bottom on mobile), to get a reference of the current UTC or mean time. You can use the military time zone chart to compare your time zone offset to UTC, which is the basis for all military time. If you wish to write out military time, you should remove the colon and the seconds as mentioned above. You can always use the handy Military Time Converter for quick calculations for other military times. The Military time clock does not use AM or PM and is always expressed in 4 digits even if the first digit is a zero. See more about how to read/write military time.